Legends of Localization has its own little spot in the Fangamer office to store the various bits and bobs relating to each project. 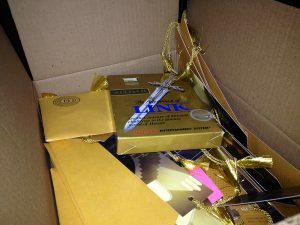 Today we found a forgotten box of bonuses that were include with the first 500 copies of the deluxe edition of the Zelda book. We kept some in case we needed them for customer service, but maybe we’ll give them out with random orders now.